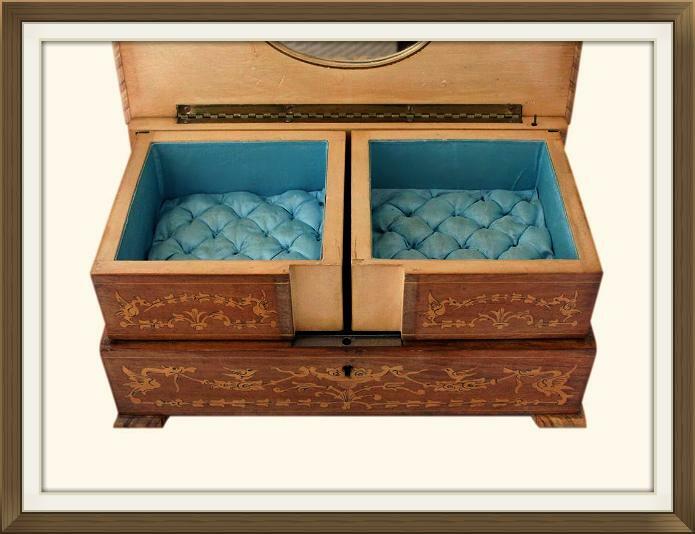 This is a fabulous vintage musical jewellery box in wonderful original condition! It was made in Sorrento, Italy, and it dates to the 1940s. 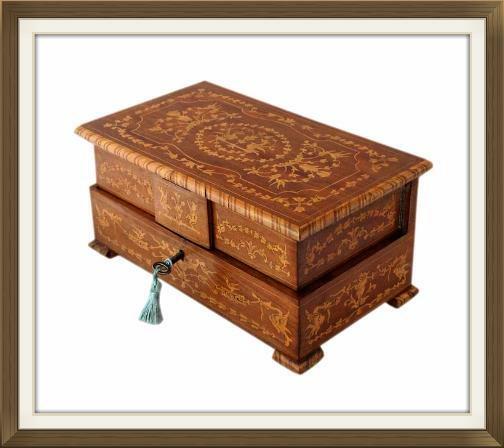 This box has stunning inlay decoration to the lid and all four sides. 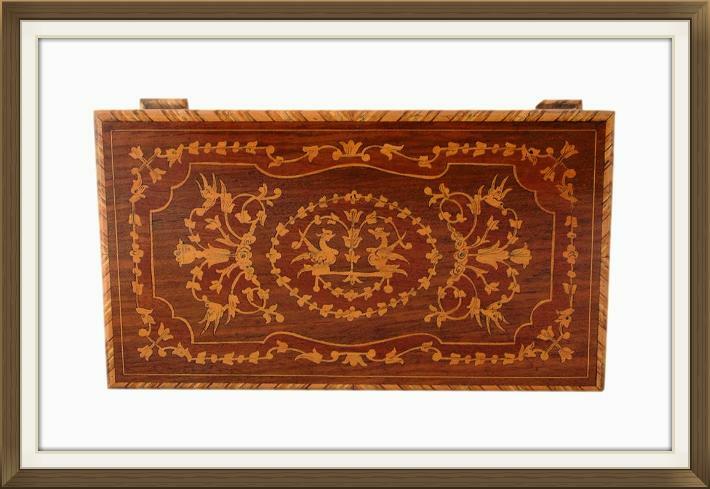 The inlay features mythological Griffin like creatures, plus beautiful birds, flowers, and leafy vines. 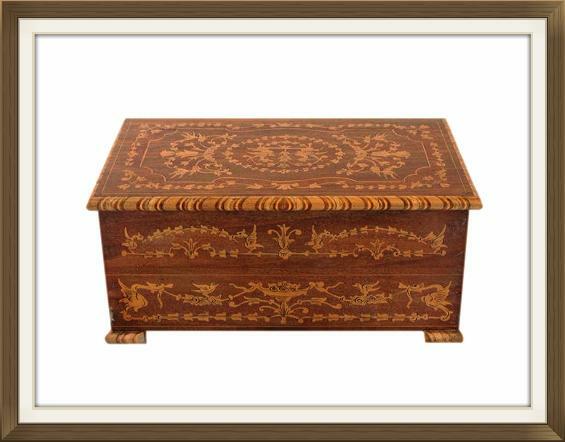 There is a beautiful inlaid border to the lid and matching inlay to the feet, and the box is beautifully finished with inlaid stringing. The lid has its original long piano hinge and the box has its original key. The hinge is a quality 'stop' hinge which prevents the lid from falling back, and the key locks the box securely. The interior has two swing opening compartments and a further larger compartment beneath. The musical movement is nicely concealed to the right of the lower compartment. All of the compartments, and the cover to the musical movement, have plump quilted satin panels. The inner walls of each compartment are finished with satin coverings. The satin is a lovely powder blue colour. There is a lovely oval mirror to the inside of the lid. 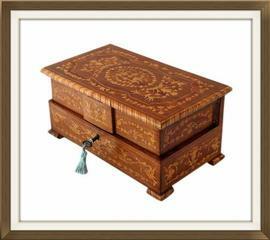 This is deeply set and has a beautiful inlaid frame around it. 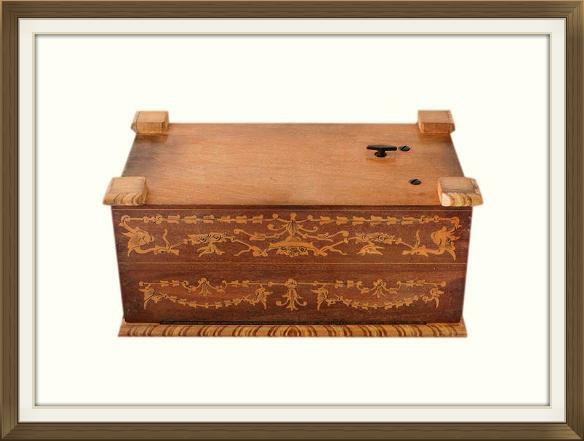 The hinges to the top compartments are original and in excellent working order. The musical movement plays a very pretty tune, the title of which we have not been able to decipher. It is operated via a wind up key on the base of the box. 7 turns of the key are sufficient to wind up the musical movement. The movement is in excellent working order. It plays the tune at its correct tempo and the music stops as it should, when the lid is closed, or when the movement is fully unwound. This wonderful box is in lovely condition for its 70 plus years of age. There is some fading to the wood on the body of the box, but that on the lid still has a beautiful rich colour. The silk to the interior has some staining/foxing. This is as we'd expect in a genuine old box which has been loved and used for its purpose. We do not recommend cleaning the satin as doing so could spoil its colour. As with all musical movements, care should be taken not to over wind them with the key. Over winding will result in the movement malfunctioning. Vintage locks and musical movements can suddenly malfunction at any time. They are already old and will naturally have some wear from age and use. We are not responsible for locks or movements that malfunction from further age and use, once the box is purchased. You can view our full returns policy which includes locks and musical movements, by visiting our Payments And Returns page. 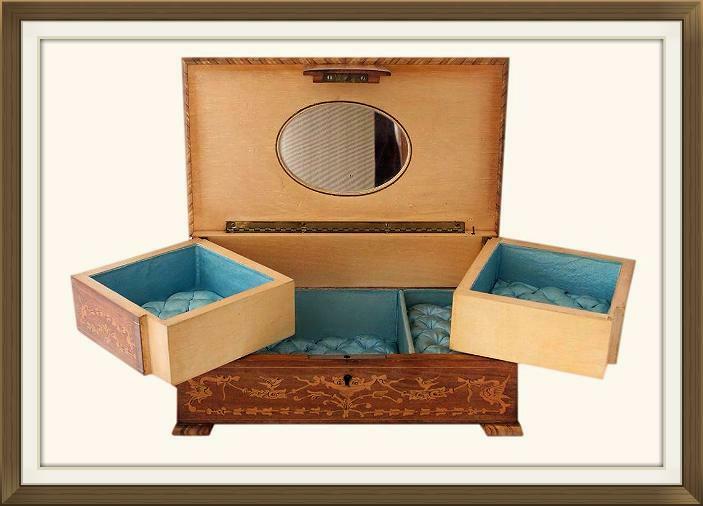 The box may not make a suitable gift for those who prefer a perfect interior. It will be most suited to those who the love the charm of a box with signs of age and use. Each 9.0cm square with a 3.5cm depth. 14.5 by 9.5cm with a 4.0cm depth.